Select Your Favorite Style and Color... 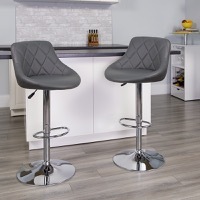 This dual purpose stool easily adjusts from counter to bar height. The bucket seat design will make this a great accent chair around the bar area or kitchen. The easy to clean vinyl upholstery is an added bonus when stool is used regularly. The height adjustable swivel seat adjusts from counter to bar height with the handle located below the seat. The chrome footrest supports your feet while also providing a contemporary chic design.